Today the cello is usually considered a classical instrument, but from the late 17th to early 19th centuries it was used in folk ensembles to provide low, driving rhythms for dance tunes and to render haunting Scottish airs. 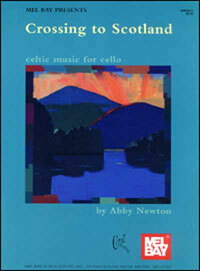 Within the folk music revival of the past forty years there has been a small but dedicated movement to restore the unique richness of the cello to traditional music, and Abby Newton has been on the forefront of that movement. Abby has been deeply involved with Scottish music ever since, traveling to and performing in Scotland many times. The airs, planxties and reels in this book come from traditional and contemporary sources, including the 18th-century fiddler Neil Gow, harper Turlough O'Carolan, Daithi Sproule, David Hornung, Alasdair Fraser, Ronnie Aimes, and others. All 19 of the tunes are written for solo cello with chord symbols included on most tunes for an accompanying instrument. The text also includes the author's notes on the origin of each tune.